Q. How is your physical condition? How are you feeling for the end of the year? RAFAEL NADAL: Good. I am fine. No problems. Q. Your injuries are not playing up? RAFAEL NADAL: No, I don't have injuries at all now. So that's good. Q. It's been by your standards a difficult year. Do you feel next year you'll be in a position to get the belief back and be challenging for Grand Slams again? RAFAEL NADAL: You never know what's going on. I am working hard. I am think I am on the right way to fight again for the things that I get used. It's something that today not worries me much. It is for me the last part of the season. I take it like a practice for the next year. I know that normally the last part of the year have been not easy for me during the years. This year little bit different story because I arrived with less victories. But still tournaments to play, at least minimum four for me. Just try to practice well on the tournaments, try to compete the way that I want to compete, and try to be closer that I needed to start the next year strong, no? For me, I said, Okay, the season is not over, but the tournaments that I going to play till the end of the season, I'm going to try my best in every single match. I going to try to do the things that I believe I need to start stronger next year. RAFAEL NADAL: World Tour Finals no. I have here, Shanghai, Basel and Bercy. Q. If you were to do very well and win a couple of them, would that make your season a bigger success in your eyes after what's happened earlier? RAFAEL NADAL: It's something that I am not thinking about. I go day by day. And seriously, is difficult to imagine things. I going to try to finish the season with the better feeling possible. Happens what happens at the end of the season. Until the end of the season, will not be a great season for me. So, no, I don't think about that. I think my real goal with that end of the year, more than win matches or have good results, is try to find another time my (indiscernible) of my game. In the US Open I did better, even if I lost the match. Tough lose, but I did better. Let's try here to do better again. I think I am working well. I am very motivated to go for that challenge that brings me the chance to overcome a tough situation for me. I love that feeling, and I going to fight to make that happen. Q. What has been your main focus in practice since the US Open? RAFAEL NADAL: Well, for sure I need to recover little bit more the forehand. In the US Open I did something important, that I played with not many mistakes. That is something that is important for me. At the same time need to recover a little bit more the intensity on my forehand, hit more winners than what I did this year. But think is simple. If I am able to play with calm again, something that has been very difficult for me during most of the time of this season, something tough for me, I was not able to control my emotions on court for a lot of months, so when that happens is almost impossible play well, no? Last couple of months I feeling that I recovered that. I don't feel that I am suffering on court as I did the first six, seven months of the season. I feel that I am more under control of my emotions on court. So that's a very big advance for me. Knowing that is improving, then, as I say before, I am working very hard and I have the motivation to improve my game again. So try little bit to play with calm. I believe that sooner or later I will be playing at a very high level again. Q. You are promoting this afternoon your academy here in China. Can you tell us some information about this academy, when it's going to open, and if you think Chinese students are going to be important to this academy. 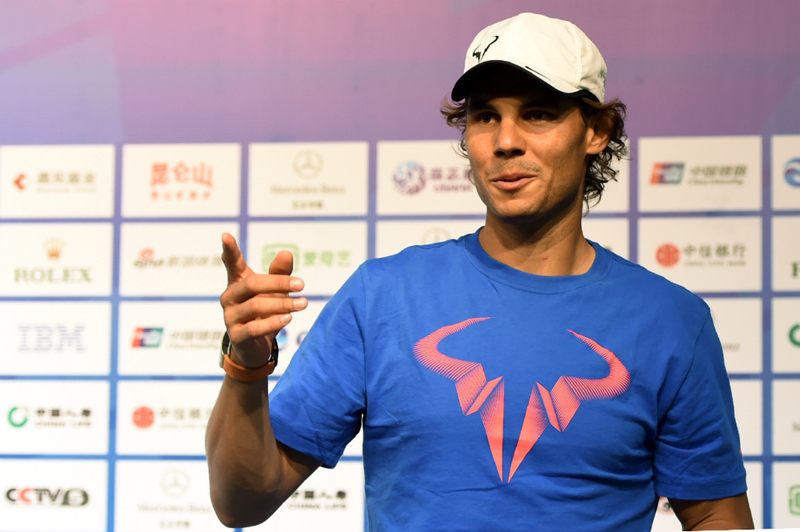 RAFAEL NADAL: For sure Asia is a very important ambition. Potential of Asia is very big. For sure we going to try to work hard on my academy to try to produce professional players from this region. The academy is under construction. Is at the end of that process. We going to open on March next year or May next year. I was confusing with the months in English (smiling). May next year. We are going to open and the next important thing is going to be the summertime 2016, then the school program for September. So is an exciting project for me. Me and my team, I think we have the knowledge of what's going on in this sport, knowing all the process, all the moments of the career, since you are a kid until you are a professional. All these phases that we have was a big learning for us and a big experience, and we hope to be able to translate all that knowledge to the next generations, and at the same time we going to have a school inside the academy. So for us is very important the education, the values. We going to work hard on that. I know not all the kids that going to come to the academy going to be professional tennis players, so we going to work as hard as we can to create as much possible professional tennis players, but we know that a very big percentage will not have the chance to live from this sport. So our goal at the same time is prepare them for the future, you know, have all the facilities for them to have the chance to keep starting inside the academy with American program that makes easy the transition to the university. So we going to have good connections with American universities. So I will always prepare them for the future like human persons. So values, sport, education are very close. So we going to work hard to try to make that happen and to help the kids to have a good future, hopefully in tennis, but if not, prepare them for the life. Q. Many observers believe that right now you have lost your confidence. Do you agree with it? This year would you like to go out to do sight‑seeing in Beijing? RAFAEL NADAL: Well, is obvious that when you lose more than what you won, you lose your confidence, no? But the confidence is back with the victories and with the good feelings on court. On the practices, there are better feelings for me. Now will remain to compete a little bit better. But I think it arrives. Every day is an opportunity to improve. I take this tournament like another opportunity to play close to I way that I want to play. I have the motivation to play here as a tournament that I love. I have one of the best memories of my career in this center, Olympics 2008. Great director of tournament, good friend. So I want to play well here and I'm going to try my best to make that happen.